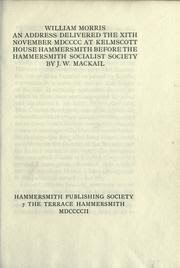 Morris’s first biographer J.W. Mackail has a penchant for arriving at a compact version, a sort of distilled essence, of whomever he writes about. In the second volume of the Morris biography he offers us a ‘single sentence [which] contains the sum of his belief in politics, in economics, in art’. It is from Morris’s review of Edward Bellamy’s utopia Looking Backward in the June 1889 issue of Commonweal: ‘Mr Bellamy worries himself unnecessarily in seeking, with obvious failure, some incentive to labour to replace the fear of starvation, which is at present our only true one; whereas it cannot be too often repeated that the true incentive to useful and happy labour is, and must be, pleasure in the work itself’. Not bad, though I’d want to see the word ‘art’ in there somewhere to make this the definitive Morris sentence. In a centenary address on John Ruskin, delivered in February 1919, Mackail offers us a rather less truncated, but still – remembering the daunting thirty-nine volumes of the Cook and Wedderburn Collected Works – usefully condensed version of Ruskin’s work: ‘His effective and permanent message is contained in the Two Paths – five lectures given in 1857-9 – and in Unto this Last, the Cornhill articles of 1860. If we know these, we know Ruskin; and if we add to these the Nature of Gothic as a preface, and the Crown of Wild Olive as an epilogue, we know him, in all essentials, fully’. Whether ardent Ruskinians would agree with so drastic a selection, I am not sure. I shall ask around at Lancaster University’s fortnightly Ruskin seminar when it kicks off again in October. Mackail gave several lectures and addresses on Morris subsequent to the biography, some of which extend his thinking in interesting new directions. And just as the biography itself has usefully appeared in a modern paperback edition, so it might be worth gathering together these later Morris writings of his, alongside other related things such as his essays on Ruskin, Swinburne and Oxford poetry. They would make a valuable volume that we might well entitle Further Studies in William Morris and his Circle. Perhaps, then, this should be the next task for the Kelmsgarth Press. Tony, Have you come across C.S. Lewis's very positive assessment of Mackail's criticism, from a letter to Arthur Greeves of June 1920: ‘The only book I have read with satisfaction recently is Mackail’s “Lectures on Poetry” : I think he is one of my favourite moderns – he always has just the right point of view and deals with the right subject: he has sent me back to “Endymoin” which I read for some time in a church porch yesterday’, p.285. Good, isn't it?